Easter Eggs and a Swap, originally uploaded by Craftydiddl. I’m a day late-i so meant to post yesterday but i got carried away with something i was working on-Will show you tomorrrow!!! So Sorry all the pictures are in a jumble, i can’t figure out how to put them in order. So we had to move egg dying day from today to yesterday because hubby got the day off yesterday but not today. Which acutally worked out because that means i have today free to do all my baking. So i boiled all the eggs, got the table all set up and that took about and hour. Called the up the boys to let them know we were ready and about 15 mins later we were done. But Little man loved it and it mainly went so fast because he was just dunking one egg after the other. He didnt really get into the sponging or writing on the eggs with the wax crayons but i understand-dunking eggs one after the other is much more fun. The colors were okay this year. For some reason pink never works, and we had 2 blues one worked aewsome and you will notice it got used alot and the other one barely worked at all. i think next year we will use liquid dyes instead. But all that didn’t matter-fun was had by all. Hubby made his few artistic ones, i made silly ones and Little man dunked and he still wants to puts stickers on his so he will do that today. So i told you i had some goodies to share yesterday and i do. I did a Ravelery swap that they had on the Penpals group and if you look up there inbetween all those egg pictures-there is one with some yarn, stickers, super cute owl notecards and notepaper, needle tip covers, those coils that hold your needles together and a little kids craft notepad. It was a wonderful package and made my day when i got it. Thank You so Much Jen!! Well i hope you are all enjoying your Saturday!! Some Easter-y stuff tomorrow!! Lovely swap package! It’s so much fun when someone picks out gifts for you. 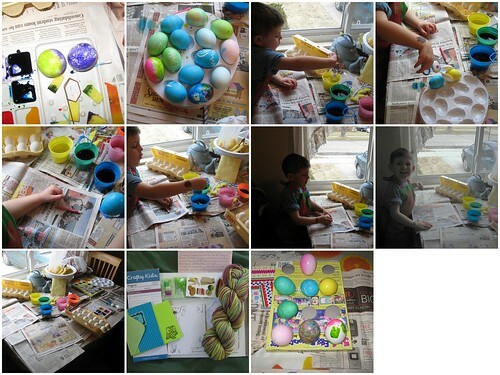 We did the tradition egg dyeing on Thursday. Our time frame was quite similiar to yours. Why does it always take three times as long to set up and clean up as it takes for the activity?? Painting the eggs is fun, I must organize it next year at my place, with some friends! *^v^* I love the colours you can get from the natural dyers like onion peels or plants.